We've seen some pretty cool tree houses in our time but this one definitely tops them. It's 10 stories high, 10,000 square feet, took 11 years to build and was, well, commissioned by God. Devout builder, landscape architect and ordained minister Horace Burgess, of Crossville, Tenn., says he (much like the biblical figure Noah) was asked by the Lord himself to build the sprawling wooden home in which he now lives. "I was praying one day, and the Lord said, 'If you build me a treehouse, I'll see you never run out of material,'" Burgess told The Sun, of his divine revelation in 1993. "It's God's treehouse." 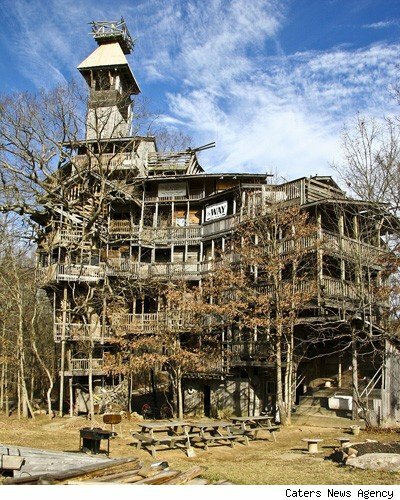 Whether you're a believer or not, the fact remains that Burgess' treehouse is likely the world's tallest, standing at a staggering 97 feet high. What's even more impressive is that the towering structure is supported by just six trees, with a live, 80-foot-tall white oak, 12 feet in diameter, at its base. The home was built entirely from wood and recycled materials and apparently, Burgess used only 258,000 nails to put everything together. Pictured is Horace Burgess with his wife outside their treehouse in Crossville, Tenn. Burgess, who lives in the 10-story wooden house, began building the structure in 1993 after, the ordained minister says, he received the go-ahead from God. Presumably the world's largest treehouse, it makes the Swiss Family Robinson look like a bunch of amateurs -- but that might be because it was commissioned by the Supreme Being. The 1960 Disney film about a family marooned on an island, features an impressive treehouse complete with its own watermill. But the Robinsons' home pales in significance next to this structure, which took builder Horace Burgess 11 years to build. Full view of Burgess' treehouse. Looking from the treehouse's balcony. Looking up at the what some call the "Minister's Treehouse." The treehouse in the winter. A view along the side of the treehouse. A Bible inside the treehouse's church. Visitors are welcome to enter the church. Another view of the church inside the treehouse. View from the treehouse of an adjacent field. Slide at the "Minister's Treehouse." 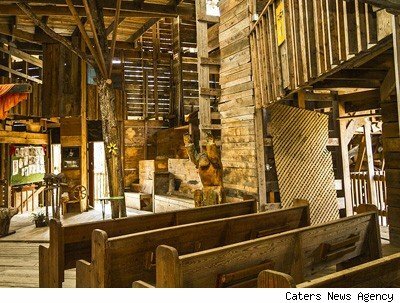 In short, it's an architectural feat, especially considering that the treehouse also boasts a space for worship (see below right) featuring pews, an altar and even a choir loft. Throw in an indoor basketball court, spiral staircases, and countless rooms, walkways and balconies, and you have yourself one very tall, very wooden masterpiece. "The treehouse is incredibly impressive," says photographer Tim Whetton, who took the now-viral treehouse pictures in mid-March. "This house is every kid's dream." Unsurprisingly, Burgess isn't the only one living out their childhood fantasy. With a push toward finding eco-friendly and cost-effective housing alternatives, much like the pre-fab home, treehouses are becoming a hot real estate trend. And it's not hard to see why: unlike a traditional brick-and-mortar home, a treehouse can be built from wood and inexpensive reclaimed supplies. In fact, thanks to his thrifty use of recycled materials, Burgess only spent $12,000 building his entire home. But before you jump on the bandwagon, keep in mind that it took Burgess over a decade to build -- and a lot of assistance from friends and family. "God used my hands to put every piece in place, but I had a lot of help," admitted the 56-year-old.